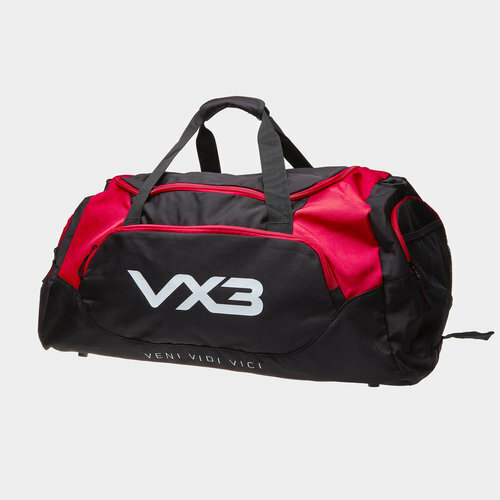 Bringing practicality to your kit bag, offering versatility ensure you transport your kit in style with the Pro Kit Bag in Black and Red from VX-3. This Vx-3 kit bag has been made with durable and weather-resistant fabric which deflects water and dirt keeping the bag and contents well protected all year round. The padded shoulder strap offers versatile carrying options, so when the arms get tired, it's easy to sling the bag over your shoulder. This bag is black and red and has been finished with the VX-3 logo printed across the side in white and just underneath that are the words "veni, vidi, vici" the VX-3 slogan.